Have you ever watched a basketball game and seen the guys at the end of the bench, the ones who seem to do nothing but cheer and wave towels? They’re all about six feet tall, white, and a little goofy looking. I was one of those guys, except on the baseball field. I tried out for the baseball team in 7th and 8th grade and didn’t make it. When 9th grade rolled around, I gave it one more shot. If I didn’t make it in 9th grade, I was done playing baseball. When tryouts started, there were 18 guys going out for the team. We knew only 16 guys would make the cut. I only had to beat out two guys. Tryouts started and I played okay. I made good plays and made mistakes. I was right on the borderline. I walked around on pins and needles on cut day. I dreaded the call to my classroom telling me Coach McKnight wanted to see me in his office. If I got that call, I was cut. If I didn’t get the call, I was on the team. I got the call in third block. As I walked out of the classroom, I saw my friends’ faces. They knew what was about to happen. When I got to Coach McKnight’s office, I was expecting a quick, “You didn’t make it. Sorry. Head back to class.” Instead, he had me sit down and we started talking. Coach McKnight was also a guidance counselor, so he was more interested in me than just as a baseball coach. We talked for a solid hour. He learned how I wanted to coach one day; that I wanted to be on the team not to be the star player but to be a part of a team that would help make everyone else better. After listening to my story, he told me he’d love for me to be a part of the team, but he didn’t think there was a spot for me. He promised to check with the varsity coach (who I was pretty sure hated me at the time) to see if they could make an exception for me. That afternoon I found out the varsity coach gave me the exception. I was on the team to practice every day, encourage the other guys, and be the guy at the end of the bench cheering and waving a towel. Coach McKnight saw who I was and how I was wired and spoke into that to build me up. Fast-forward four years to my freshman year at community college when I interned with our varsity team as a coach. On the way to a playoff game, on one of those long bus rides in an uncomfortable activity bus, all the coaches were in the front talking and killing time. One of the assistant coaches was a guy named Coach Newsome. He was my Little League coach when I was ten. His son was one of the two guys I had to beat out my freshman year who made the team over me. He didn’t mean to, but in that moment, he did the exact opposite of Coach McKnight. Where Coach McKnight spoke into who I was and called me to more, Coach Newsome inadvertently tore me down. We all have those voices in our life. Whether we realize it or not, when we’re quiet, when we’re driving down the road, when we’re in the shower, those voices pop into our heads. More times than not, it’s the Coach Newsome voice. 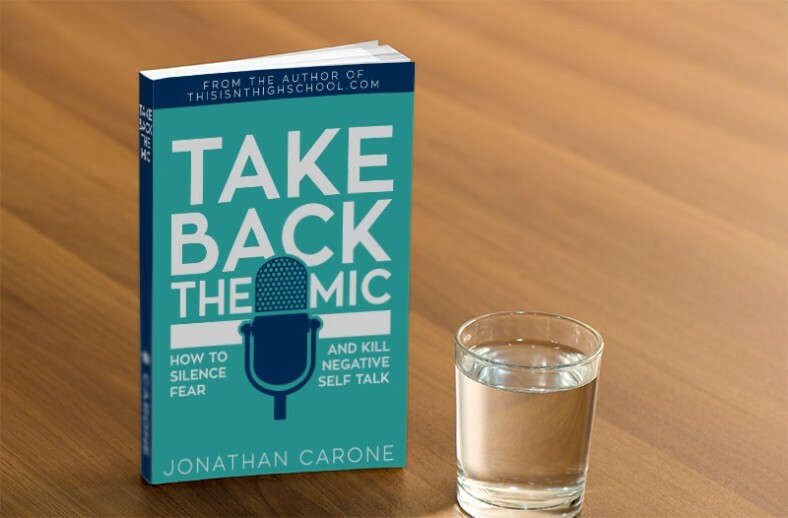 If you want to know more about the voices, check out my new Ebook called, “Take Back The Mic: How To Silence Fear And Kill Negative Self Talk.” It’s out today and it’s completely free. All I ask from you is your e-mail address.